In 1919 England, in the shadow of The Great War, many look to the spirit world for answers. 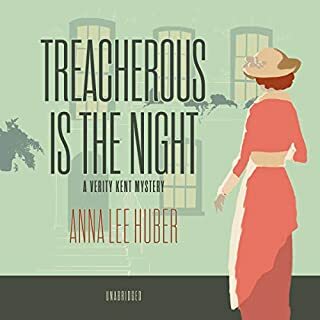 But it will take an all-too-earthbound intrigue to draw in the discerning heroine of Anna Lee Huber's latest mystery. It's not that Verity Kent doesn't sympathize with those eager to make contact with lost loved ones. After all, she once believed herself a war widow. But now that she's discovered Sidney is very much alive, Verity is having enough trouble connecting with her estranged husband, never mind the dead. Still, at a friend's behest, Verity attends a seance. Excellent story! Need a new narrator! I’ve enjoyed Verity’s adventures so far. I read the first book in the series and listened to the second. I’m going to have to go back to reading as the narrator left a lot to be desired. She has a strange habit of ending virtually all sentences on a downward tone (sort of like a news reporter on a live newscast). The cadence was off-kilter and she often forgot to change back to her narration voice after delivering a character’s line. Very distracting to what is otherwise a well-layered, historical adventure that gives the reader insight to the aftermath of World War I in England and Europe. Believe it or not, you learn even more! I really enjoyed this book as told from Rabia's POV. She is generous with information about herself and her evolution through the years of Adnan's arrest, trial and incarceration. We also hear from Adnan through letters he has written to various people while he has been in prison. He provides insight into many questions still unanswered about the decisions and actions he has taken. There is more information gleaned from this book and like the Undisclosed podcast, Rabia hints that there is still more to come pending the appeal of the PCR ruling and possible new trial. 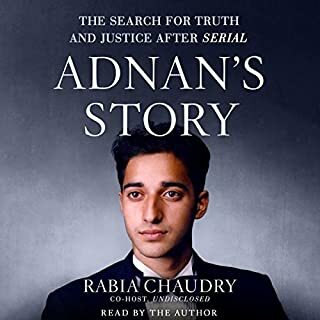 A great read for anyone who has been listening to Adnan's story since Serial started it all. What made the experience of listening to Scared Stiff the most enjoyable? The premise of the series is sound. Mattie is a character you want to root for and the predicaments in which she finds herself are quite funny. These are light, fun murder mysteries easy to follow but not necessarily predictable. I'm not sure any other character besides Mattie is drawn out enough for the reader to have a favorite, other than her. Having said that, Mattie is a great character. She has flaws and insecurities every woman can relate to and yet the situations in which she lands are outrageous enough to make you laugh and think "phew...that would never happen to me." What three words best describe Jorjeana Marie’s performance? No.The book is perfectly suited for my long, daily commute, but unfortunately I cannot listen to the narrator for hours. She sounds like she has a cold. Her portrayal of the male characters are good, but her attempt at the Wisconsin accent is spotty. One example, the main character's sister seems to have the Wisconsin accent (sometimes), yet the main character does not.The stories, the murder mysteries are very entertaining and Mattie's POV with her nursing training provides a unique sleuthing technique. I love that she knows everyone in the small town based on her knowledge of their very private medical problems. The main character, Mattie, is 37-38 years old. Enough with the stupid sexual references to male body parts and other such similar teenage-boy, frat house chat. I don't know of any female, let alone, a mature, smart, woman who speaks like that. A little bit is funny, the rest is eye-rolling and tiresome. In this book, the 87 year old Bjorn's continued references to his "Peter" were beyond nauseating.